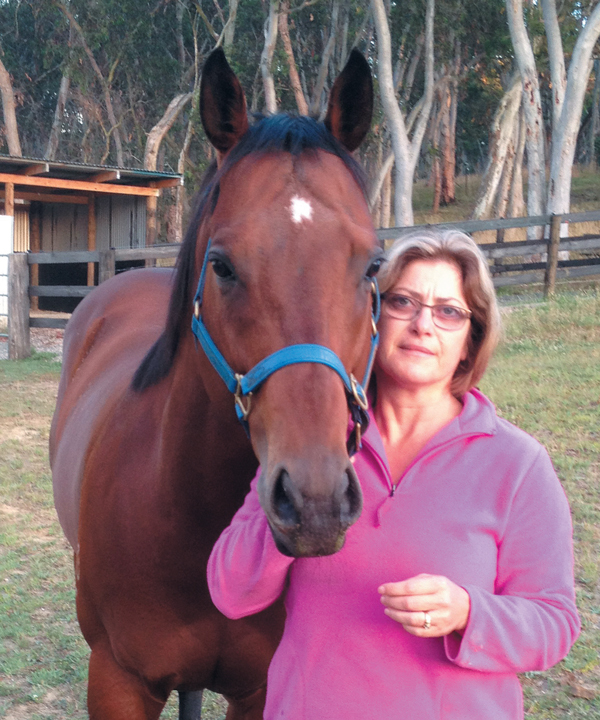 VARDA GREEN has had a lifelong love of horses, but the possibility of running a thoroughbred breeding operation had never crossed her mind until about three years ago. It was then at the suggestion of her partner Ian Macpherson that the pair decided to establish a stallion station on 8ha (20 acres) they have at Berrima in the southern highlands of New South Wales. Since then four stallions, Shellscrape, Helenus, Foreplay and Master Harry, have taken up residence at the Wattle Grove Stud. Apart from suffering a setback with Shellscrape, who has been taken out of public stud duty, everything has since gone smoothly for their new business. However, the direction that her life has taken still remains something of a surprise to Varda. It also helped that their backgrounds meshed, when Ian’s years as a successful trainer and as a bloodstock consultant with Inglis were combined with Varda’s passion. Along the way Varda had retired from her riding activities to concentrate on parenthood and a career in catering, but says she was a “mad horse person even as a young kid”. Born in Israel, she was just two when her parents Tibby and Edith Genat emigrated to Australia. The family settled in Sydney where Varda went to Rose Bay Public School and began riding at pony club. “From a very early age I always wanted to have a pony. I drove Dad crazy until that came to fruition when I was about 10. Although we were living in the guts of Sydney I was fortunate enough to be able to have horses at the Sydney Showgrounds. I went through the Eastern Suburbs Pony Club and I also went to pony club in Centennial Park. Then at 27 she married Simon Green and after their first child Jeremy was born, they also have a daughter Danielle, she stopped nursing to concentrate on motherhood. At that stage the Greens bought 25 acres (10ha) at Sutton Forest in the NSW southern highlands to “improve their lifestyle”. “When my marriage broke down I went back to Sydney to rejoin the family who by then were in the catering business at the Hakoah Club in Bondi. My father was in the kitchen and I looked after the front of house for the restaurant, organised client functions and generally ran the business. It was hard work, very anti-social hours and very difficult, but I had to do that through necessity being a single parent raising two children. During those years Varda and Ian, the father of Alex, who is currently in the United States, Millie and Georgie, had met through their children, who were “about the same age”. One of the most pleasant and genuine people in the thoroughbred industry Ian had, in earlier years, been a trainer at Randwick. Right from the start Ian had some handy horses including the Shining Finish (GB) gelding Algonquin Club, whose wins featured the AJC Colin Stephen Quality-Gr.3 (2400m), Canberra Cup-LR (2400m) in 1987 and the AJC Spring Cup-LR (2000m). Another stable member was Committal, by Covetous, whose efforts included a third in the Black Opal Stakes (1200m)-Gr.2 at Canberra in 1990 and victories in the STC Darby Munro Quality-LR (1300m) at Rosehill and BATC Courier Mail Classic-LR (1350m) at Doomben the following year. He also won a QTC Castlemaine Perkins Handicap-LR (1600m) and another Spring Cup with the Chem (USA) gelding Instrumental and an AJC Breeders Plate-LR (1000m) with Volts, who was by County. However when his youngest daughter Georgie complained, as an eight year-old, that she “hadn’t ever had breakfast with her father”, Ian decided to hand in his licence and devote more time and attention to his family. After that he worked in a merchant bank for a 12 months stint before joining Inglis in 2002 as a bloodstock consultant, which lasted through until he and Varda began operating Wattle Grove as a stallion station. The 8ha on which Varda and Ian now conduct their stallion station was a “very run down, tired old equine farm”. “We set about doing a lot of fencing, pasture improvement and that sort of thing, but at first we didn’t really know what we wanted to do. Then, we found a few studs down south were closing down or cutting back, and by our count 16 stallions had left the southern districts. Everything began cranking into gear as the 2011 breeding season was approaching when Ian secured the Dane Shadow horse Shellscrape as the station’s foundation stallion. He had proved himself to be a very capable performer winning the AJC The Galaxy-Gr.1 (1100m), Roman Consul Stakes-Gr.2 (1200m), San Domenico-Gr.3 (1000m) and Tatts (Qld) Tattersalls Two Year-Old Stakes-LR (1400m). He attracted 60 mares in his first season, but although he has continued to stand privately, Shellscrape is, tragically, suffering from an as yet undetermined genetic or toxic affliction, which has seen a number of his foals born without tails. Fortunately the partners subsequently achieved what is now shaping as a major breakthrough when, after coming to the agreement to stand Shellscrape, they finalised a deal enabling them to add Helenus to the roster. When in the stable of Leon Corstens Helenus, a son of the Fairy King (USA) horse Helissio (IRE), was a racehorse of the highest class. His five wins were registered in the VRC Victoria Derby-Gr.1 (2500m), STC Rosehill Guineas-Gr.1 (2000m), VATC Caulfield Guineas-Gr.1 (1600m), MVRC Moonee Valley Vase-Gr.2 (2040m) and Bill Stutt Stakes-Gr.2 (1600m). Those performances earned Helenus the title of Australasia’s Champion Middle Distance Three Year-Old of 2002-03. After a relatively slow start to his stud career, he is now attracting attention as the sire of, among others, the 2011 STC The BMW-Gr.1 (2400m) winner Cedarberg and the 2012 ATC Australian Derby-Gr.1 (2400m) winner Ethiopia. While Cedarberg’s life came to a premature end, there is every indication that Ethiopia is set to the scale even greater heights, providing he overcomes an injury he suffered in the 2012 Emirates Melbourne Cup. Obviously that will further boost the stocks of Helenus (ex Worldwide Elsie (USA) by Java Gold). The activity at Wattle Grove further intensified this year with the addition of the Danehill (USA) horse Foreplay, and Master Harry who is by the Yarraman Park stallion Magic Albert. An agreement was reached with Woodside Park in Victoria to stand Foreplay who had coincidentally begun his stud career at Yarraman Park at Scone. A stakeswinning brother to Champion South African Sprinter Laisserfaire, Foreplay (ex Procrastinate by Jade Hunter (USA)) has been represented by the likes of STC Golden Slipper Stakes-Gr.1 (1200m) second placegetter Decision Time. A winner of the ATC Royal Sovereign Stakes-Gr.3 at Randwick and two Listed Races at Flemington when in Peter Moody’s stable, Master Harry (ex Sri Lanka by Sri Pekan (USA)) is also fulfilling expectations. His appeal to breeders is strengthened by the fact that his dam Sri Lanka was a speedster who won six races and is a daughter of the AJC Widden Stakes-LR winner Momentaire, a daughter of Golden Slipper winner Marscay. “Like the others Master Harry is a joy to handle,” Varda said. “We are very privileged to have four stallions who have wonderful temperaments. I don’t handle the stallions much, but I’m able to feed them and put their rugs on if required because they are four such kind, gentle horses. Ian handles the serving of the mares and looks after the day-to-day maintenance of the horses and we work together with the cleaning of boxes, the making of feeds, and so on. It’s been a wonderful experience and we are thrilled to be out here because the lifestyle is terrific. We’re both loving what we are doing. Besides, having everything going along as well as we’d hoped for with Wattle Grove, we’ve met a lot of nice people in the district . . . both horsey and non-horsey.